If you’re an athlete, or even just a person who enjoys living an active lifestyle, you’ve probably heard of or know people who use Kinesiology tape. Kinesiology taping is a process that is used for treating athletic injuries and a variety of physical disorders, including: whiplash, tendonitis and even bad posture. Kinesiology tape is a thin, stretchy, elastic cotton strip complete with an acrylic adhesive. The tape has a similar elasticity and thickness to human skin which makes it less constrictive and therefore allows for greater freedom of movement It’s used by athletes and physiotherapists to treat a wide variety of musculoskeletal and sports injuries, inflammatory conditions as well as improve overall athletic performance. The benefits of taping are numerous, with more and more athletes sharing their success with the process. Here are just a few of the upsides of taping. 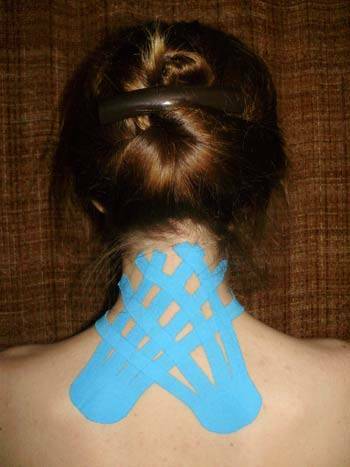 Kinesiology taping eases pain both physically and neurologically. The lifting action of the tape helps to relieve pressure on pain receptors located beneath your skin which brings relief to those suffering from acute injuries and chronic pain. The process is particularly effective during rehabilitation after an injury, or if you are experiencing pain that is out of proportion to the severity of your injuries. Taping is known to improve circulation, delivering oxygen and nutrients on a cellular level and helping to accelerate the removal of waste products. Both of these mechanisms can help prevent or relieve spasms and cramps in overused or injured muscles. Since kinesiology taping helps your body get rid of waste products faster, it also aids in the elimination of lactic acid after exercise or strain. Therefore it helps your body recover from injuries far more quickly and helps speed up the injury rehabilitation process, allowing athletes to get back on the field again far sooner. Due to its elasticity and thickness, kinesiology tape provides improved support and stability for strained muscles and injuries without constricting them. The nature of the tape discourages harmful movements but still allows a healthy range of healthy motion. The tape reduces pressure in your lymphatic drainage system, making it less likely for fluids to collect in the injured area, thus limiting swelling and bruising. This applies not only to sports injuries, but to other inflammatory conditions, including the extreme swelling of lymphedema. If you sound like you could benefit from the therapeutic rewards of kinesiology, don’t forget to consult your doctor before trying the process out yourself. Taping requires a certain amount of skill and knowledge, and going in unprepared can actually do more harm than good. Here’s to a happy and healthy 2015.